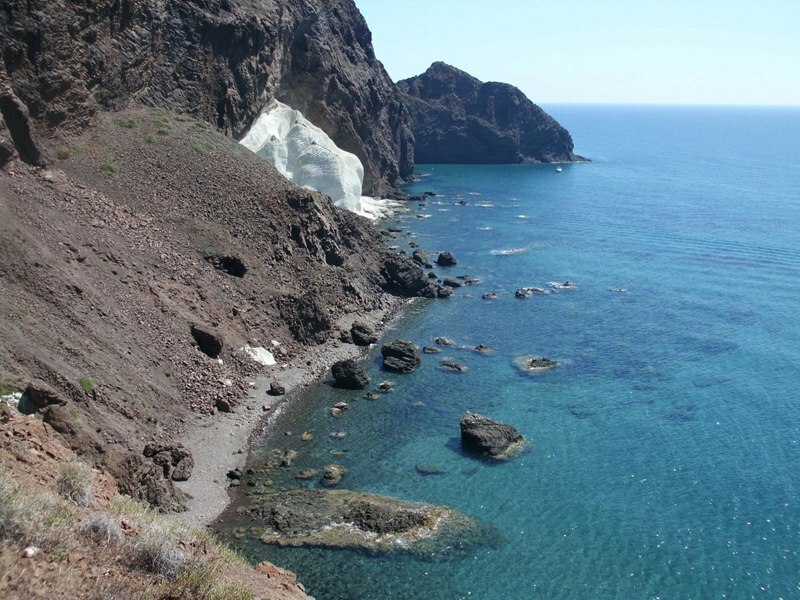 Inactive Volcanoes: If you are passionate about geology, the Natural Park of Cabo de Gata-Nijar is a great place to study volcano landforms and its Geology. 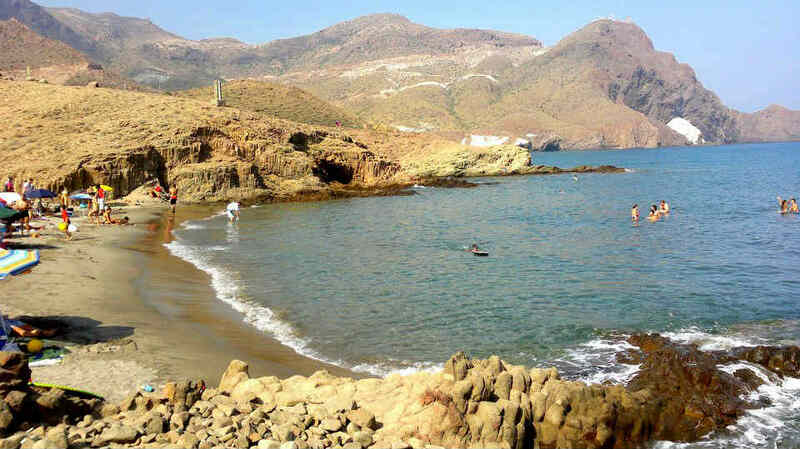 The volcanic complex and the Cabo de Gata reef is the emerged part of a large area presently submerged beneath the magmatic Mediterranean Sea, in the Alboran area. In a marine environment, and favored by the weakness of some major tectonic features of the terrain, the deep magma rises to the surface generating numerous volcanic edifices, mostly underwater, on which coral reefs are developing in form of atolls or coastal reefs. 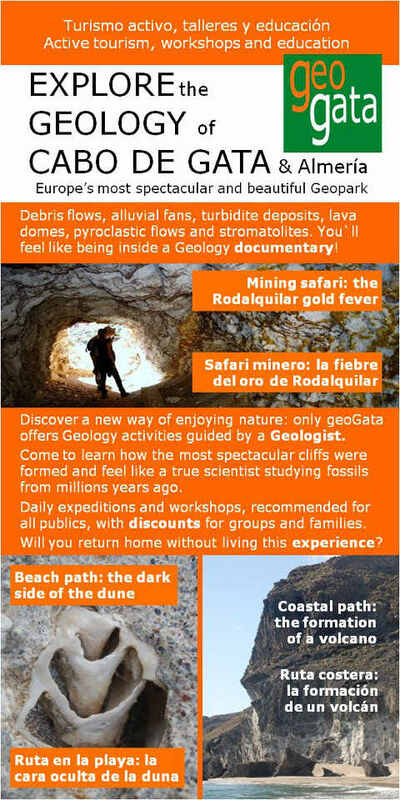 This peculiar geological setting is one of the most unique volcanic and fossil formation in Europe, being of great educational, scientific and geotourism interest. Volcanic Domes of "Punta Baja", "El Faro" and "Vela Blanca"
The coast around the lighthouse of Cabo de Gata, shows an excellent outcrop of massive volcanic rocks with the structure of volcanic features known as "domes". These formations are more than 12 million years old! The most pronounced is columnar jointing, typical of massive rocks. It is produced through the slow cooling of lava after its emplacement. Upon cooling the volume of lava diminishes slightly, and this contraction is accommodated by the formation of regularly-spaced joints, in a perpendicular arrangement with respect to the cooling surface of the lava. The peculiar shape of these hexagonal columns of rock, means that they have been utilised, in this and many other places in the Sierra de Cabo de Gata, for obtaining paving slabs. 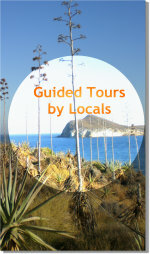 Surrounding the Punta-Baja Cabo de Gata domes, white-coloured rocks known as "tuffs" can be seen in the distance. These rocks have a pyroclasic origin (ignibrites - old volcano ashes), which means they were formed due to highly explosive eruptions. 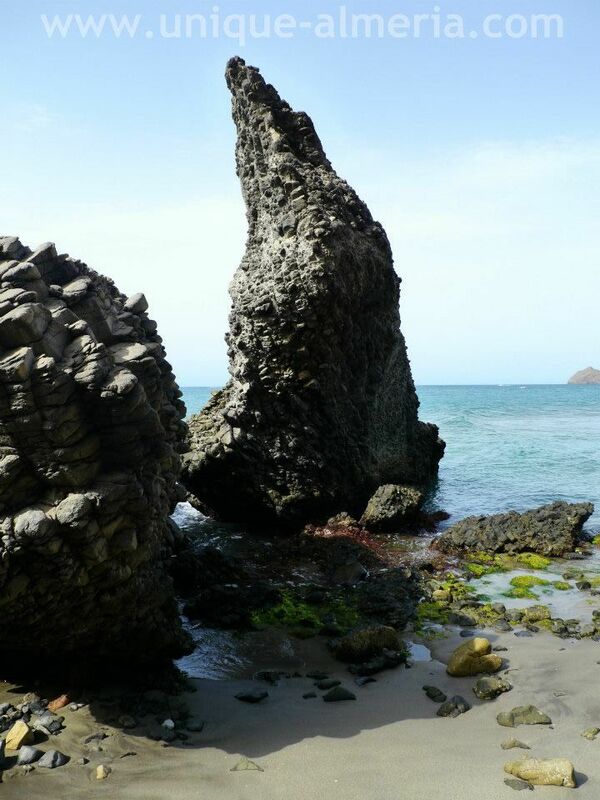 This one, in particular, is being called "Vela Blanca" (The White Sail) as it is said that during the time sailors gave the name to that rock because from the sea, it looks like a ship sail, and it used to be a reference avoiding ships to wreck in this stormy corner of the Iberian coast.